"TCMOS" redirects here. See also CMOS (disambiguation). The Chicago Manual of Style, 17th edition (2017). Editions 1–16 in background. The Chicago Manual of Style (abbreviated in writing as CMOS or CMS, or sometimes as Chicago) is a style guide for American English published since 1906 by the University of Chicago Press. Its seventeen editions have prescribed writing and citation styles widely used in publishing. It is "one of the most widely used and respected style guides in the United States". The guide specifically focuses on American English and deals with aspects of editorial practice, including grammar and usage, as well as document preparation and formatting. It is available in print as a hardcover book, and by subscription as a searchable website as The Chicago Manual of Style Online. The online version provides some free resources, primarily aimed at teachers, students, and libraries. Many publishers throughout the world adopt "Chicago" as their style. It is used in some social science publications, most historical journals,[attribution needed] and remains the basis for both the Style Guide of the American Anthropological Association and the Style Sheet for the Organization of American Historians. The Chicago Manual of Style includes chapters relevant to publishers of books and journals. It is used widely by academic and some trade publishers, as well as editors and authors who are required by those publishers to follow it. Kate L. Turabian's A Manual for Writers of Research Papers, Theses, and Dissertations also reflects Chicago style. Chicago style offers writers a choice of several different formats. It allows the mixing of formats, provided that the result is clear and consistent. For instance, the fifteenth edition of The Chicago Manual of Style permits the use of both in-text citation systems and/or footnotes or endnotes, including use of "content notes"; it gives information about in-text citation by page number (such as MLA style) or by year of publication (like APA style); it even provides for variations in styles of footnotes and endnotes, depending on whether the paper includes a full bibliography at the end. Two types of citation styles are provided. In both cases, two parts are needed: first, notation in the text, which indicates that the information immediately preceding was from another source; and second, the full citation, which is placed at another location. Using author-date style,[a] the sourced text is indicated parenthetically with the last name(s) of the author(s) and the year of publication with no intervening punctuation. Research has found that students do not always cite their work properly (Smith 2016). When page numbers are used, they are placed along with the author's last name and date of publication after an interposed comma. Research has found that students do not always cite their work properly (Smith 2016, 24). If the author's name is used in the text, only the date of publication need be cited parenthetically (with or without the page number). Research done by Smith found that students do not always cite their work properly (2016). In-text citations are usually placed just inside a mark of punctuation. An exception to this rule is for block quotations, where the citation is placed outside the punctuation. The full citation for the source is then included in a references section at the end of the material. As publication dates are prominent in this style, the reference entry places the publication date following the author(s) name. Heilman, James M., and Andrew G. West. 2015. "Wikipedia and Medicine: Quantifying Readership, Editors, and the Significance of Natural Language." Journal of Medical Internet Research 17 (3): e62. doi:10.2196/jmir.4069. Using notes and bibliography style,[b] the sourced text is indicated by a superscripted note number that corresponds to a full citation either at the bottom of the page (as a footnote) or at the end of a main body of text (as an endnote). In both instances the citation is also placed in a bibliography entry at the end of the material, listed in alphabetical order of the author's last name. One of the main differences in structure between a note and a bibliography entry is the placement of commas in the former and periods in the latter. 1. James M. Heilman and Andrew G. West, "Wikipedia and Medicine: Quantifying Readership, Editors, and the Significance of Natural Language," Journal of Medical Internet Research 17, no. 3 (2015): e62, doi:10.2196/jmir.4069. Heilman, James M., and Andrew G. West. "Wikipedia and Medicine: Quantifying Readership, Editors, and the Significance of Natural Language." Journal of Medical Internet Research 17, no. 3 (2015): e62. doi:10.2196/jmir.4069. The most significant revision to the manual was made for the twelfth edition, published in 1969. Its first printing of 20,000 copies sold out before it was printed. In 1982, with the publication of the thirteenth edition, it was officially retitled The Chicago Manual of Style, adopting the informal name already in widespread use. More recently, the publishers have released a new edition about every seven to ten years. The fifteenth edition (2003) was revised to reflect the emergence of computer technology and the internet in publishing, offering guidance for citing electronic works. Other changes include a chapter on American English grammar and use, and a revised treatment of mathematical copy. In August 2010, the sixteenth edition was published simultaneously in the hardcover and online editions for the first time in the Manual's history. In a departure from the earlier red-orange cover, the sixteenth edition features a robin's-egg blue dust jacket (a nod to older editions with blue jackets, such as the eleventh and twelfth). The sixteenth edition featured "music, foreign languages, and computer topics (such as Unicode characters and URLs)". It also expands recommendations for producing electronic publications, including web-based content and e-books. An updated appendix on production and digital technology demystified the process of electronic workflow and offered a primer on the use of XML markup. It also includes a revised glossary, including a host of terms associated with electronic and print publishing. The Chicago system of documentation is streamlined to achieve greater consistency between the author-date and notes-bibliography systems of citation, making both systems easier to use. In addition, updated and expanded examples address the many questions that arise when documenting online and digital sources, from the use of DOIs to citing social networking sites. Figures and tables are updated throughout the book, including a return to the Manual's popular hyphenation table and new, selective listings of Unicode numbers for special characters. The seventeenth edition was published in September 2017. It offers new and expanded style guidelines in response to advancing technology and social change. It also includes new and revised content reflecting the latest publishing practices and electronic workflows and self-publishing. Citation recommendations, the glossary of problematic words and phrases, and the bibliography have all been updated and expanded. In the seventeenth edition email lost its hyphen, internet became lowercase, the singular "they" and "their" are now acceptable in certain circumstances, a major new section on syntax has been added, and the longstanding recommendation to use "ibid" has changed due to electronic publishing. In 2013, an adapted Spanish version was published by the University of Deusto in Bilbao, Spain. In April 2016, the publisher released The Chicago Guide to Grammar, Usage, and Punctuation, Bryan A. Garner's expansion of his Chicago Manual of Style chapter on the topic, and coinciding with the release of the new edition of Garner's Modern American Usage. The Chicago Manual of Style (fifteenth ed.). University of Chicago Press. 2003. ISBN 978-0226104034. The Chicago Manual of Style (sixteenth ed.). University of Chicago Press. 2010. ISBN 978-0226104201. The Chicago Manual of Style (seventeenth ed.). University of Chicago Press. 2017. ISBN 978-0226287058. Oxford Standard for Citation of Legal Authorities or "OSCOLA"
^ As used with periodical/journal articles. ^ The Heilman and West example article was published electronically without page numbers. ^ a b "Why Are there Different Citation Styles?". Center for Teaching and Learning. Yale University. Retrieved August 7, 2018. ^ a b "Author-Date References: Text Citations – Basic Form". The Chicago Manual of Style (16th ed.). 15.21: University of Chicago Press. 2010. ISBN 978-0226104201. ^ "The Author-Date System: An Overview". The Chicago Manual of Style (16th ed.). 15.5: University of Chicago Press. 2010. ISBN 978-0226104201. ^ "Author-Date References: Text Citations in Relation to Direct Quotations". The Chicago Manual of Style (16th ed.). 15.25: University of Chicago Press. 2010. ISBN 978-0226104201. ^ "Author-Date References: Basic Structure of a Reference List Entry". The Chicago Manual of Style (16th ed.). 15.6: University of Chicago Press. 2010. ISBN 978-0226104201. ^ "Author-Date References: Placement of Dates in Reference List Entries". The Chicago Manual of Style (16th ed.). 15.14: University of Chicago Press. 2010. ISBN 978-0226104201. ^ "Notes and Bibliography: Basic Structure of a Note". The Chicago Manual of Style (16th ed.). 14.15: University of Chicago Press. 2010. ISBN 978-0226104201. ^ a b "Notes and Bibliography: Basic Structure of a Bibliography Entry". The Chicago Manual of Style (16th ed.). 14.16: University of Chicago Press. 2010. ISBN 978-0226104201. ^ "Notes and Bibliography: Punctuation in Periodical Citations". The Chicago Manual of Style (16th ed.). 14.173: University of Chicago Press. 2010. ISBN 978-0226104201. ^ "Notes and Bibliography: Journal Article – Title". The Chicago Manual of Style (16th ed.). 14.176: University of Chicago Press. 2010. ISBN 978-0226104201. ^ "Notes and Bibliography: Title of Journal". The Chicago Manual of Style (16th ed.). 14.179: University of Chicago Press. 2010. ISBN 978-0226104201. ^ a b c "Notes and Bibliography: Journal Volume, Issue, and Date". The Chicago Manual of Style (16th ed.). 14.180: University of Chicago Press. 2010. ISBN 978-0226104201. ^ "Notes and Bibliography: Page Numbers and Other Locators". The Chicago Manual of Style (16th ed.). 14.17: University of Chicago Press. 2010. ISBN 978-0226104201. ^ "Notes and Bibliography: Journal Page References". The Chicago Manual of Style (16th ed.). 14.183: University of Chicago Press. 2010. ISBN 978-0226104201. ^ "Notes and Bibliography: Digital Object Identifiers (DOIs)". The Chicago Manual of Style (16th ed.). 14.6: University of Chicago Press. 2010. ISBN 978-0226104201. 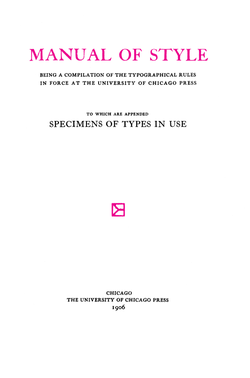 ^ Manual of Style: Being a Compilation of the Typographical Rules in Force at the University of Chicago Press. Chicago: U of Chicago P, 1906, 203. ^ a b "The History of the Chicago Manual of Style", University of Chicago Press, 2010. Retrieved March 17, 2011. ^ Geoffrey K. Pullum, "The Chicago Manual of Style – and Grammar", Language Log, February 2, 2005. Accessed February 12, 2012. ^ "Manual de estilo Chicago-Deusto". Publicaciones. University of Deusto.